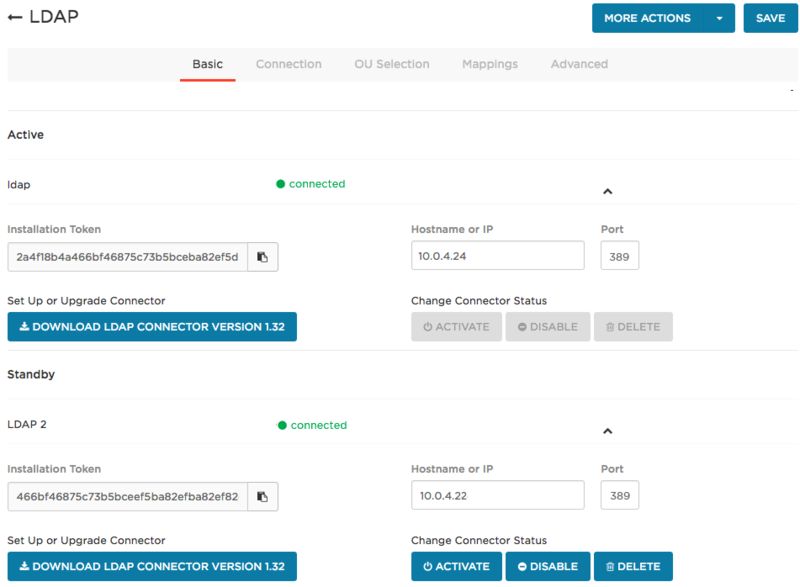 You can install multiple LDAP Directory Connectors to provide failover for your LDAP directory integration with OneLogin. One connector will be Active (primary), and the others will be defined as standby connectors. If an active connector fails, OneLogin can find and fail over to a standby connector. Note. If authentication, password update, or password reset requests to the primary (active) LDAP Directory Connector fail to generate a response within 250 milliseconds, the system automatically resends these requests (fails over) to a standby connector. If user sync fails, you must activate a standby connector manually by clicking the Activate button (see below). Go to Users > Directories. Click the directory to which you want to add the failover connector. Select Add A Connector Failover. Provide a name for the new Failover Connector. Select the arrow on the far right hand side to reveal the Installation Token. Download and install a new instance of the the LDAP connector using the token that you copied in the previous step. Follow the installation instructions in Installing and Configuring LDAP Directory Connector 2 or Installing and Configuring LDAP Directory Connector 1. When you have installed and started the standby LDAP connector, return to Users > Directories > Your LDAP Directory to confirm that the standby is connected. If authentication, password update, or password reset requests to the primary (Active) LDAP Directory Connector fail to generate a response within 250 milliseconds, the system automatically resends these requests (fails over) to a standby connector. If user sync fails, however, you must manually activate a standby connector by clicking the Activate button. This turns the standby into the primary connector and demotes the failing connector to standby. User sync failures are logged to the LDAP Directory Connector log file as exceptions of type UserSyncServiceException. For more information, see "Logging" in Installing and Configuring LDAP Directory Connector 2.